Its a girl! When do you name her? When should you throw the party? After eight days, two weeks, a month? As opposed to a brit, circumcision, of a boy on the eighth day, there are no explicit rituals for a girl. Instead, there are customs for a Simchat Bat, celebration of a birth of a daughter. The Aramaic words for Simchat Bat are Zeved Bat which means gift -- G-d gave me a good present. Rabbi Moses Maimonides (Rambam), a 12th century philosopher, explains the words to mean that this is a good material or better yet this is a good branch -- that the daughter is the mother of the family in which many other branches stem. 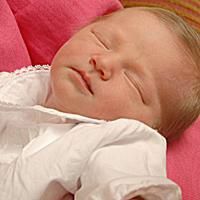 Most Ashkenazi Jews name a baby girl the first Sabbath after she is born, but its acceptable to name her at any Torah reading (the Torah is read Monday and Thursday mornings as well as holidays and the Sabbath). The father is called up to the Torah and the child is given her name. A special prayer is also said at this time for the well being of the mother and daughter. The prayer starts off with mentioning the patriarchs: Abraham, Isaac and Jacob. If the mother is present she says a Thanksgiving Prayer, or her husband can say it on her behalf. In general, the Thanksgiving Prayer is said when one has survived a life threatening situation and delivering a baby falls into this category. Many Sephardi Jews also name the baby at the Torah reading and in addition read a verse from Song of Songs, chapter 2, verse 14, At the sea He said to me, O My dove, trapped at the sea as if in the clefts of the rock, the concealment of the terrace. Show Me your prayerful gaze, let Me hear your supplicating voice, for your voice is sweet and your countenance comely. If the girl is the first born, an additional verse from Song of Songs is said, chapter 6, verse 9, Unique is she, My constant dove, My perfect one. Unique is she, this nation striving for the truth; pure is she to Jacob who begot her. Nations saw her and acclaimed her; queens and concubines, and they praised her. In contrast to the Ashkanzims blessing which begins with the patriarchs, the one by the Sepharadim begins with the matriarchs: Sara, Rebecca, Rachel and Leah. In some Sephardi communities the girl is only named at home. They believe that the mother and baby shouldnt leave the house for a month and therefore the naming is done at home so both mother and daughter can be present for it. There are also various customs performed to ward off the evil eye. The birth of a child is a momentous occasion that we all want to share with everyone around us. That is why we, in modern day times, have created a more formal service of bringing our daughters into the world -- into the covenant with G-d -- the same as what we do for our sons. Since there is no specific format to go by, people have created their own traditions as to when to have a party for the baby -- celebrate the Simchat Bat -- and what rituals, if any, are performed at the festivity. Some have a light meal after synagogue the Sabbath in which the father has named the baby, while others invite family and friends to their home or to a hall on a different day to share in their joy (simcha). Others opt to make it into more of a traditional ceremony citing various prayers (such as from the Book of Psalms), saying a special blessing over wine and having a festive meal. Whichever form of celebration is followed, Jewish families are increasingly finding formal ways of expressing joy on the birth of a girl as well as the birth of a boy. Simchat Bat Getty Images Naming Ceremonies for Jewish Girls Its a girl! When do you name her? When should you throw the party? After eight days, two weeks, a month? The Aramaic words for Simchat Bat are Zeved Bat which means gift -- G-d gave me a good present. Rabbi Moses Maimonides (Rambam), a 12th century philosopher, explains the words to mean that this is a good material or better yet this is a good branch -- that the daughter is the mother of the family in which many other branches stem. Whichever form of celebration is followed, Jewish families are increasingly finding formal ways of expressing joy on the birth of a girl as well as the birth of a boy.